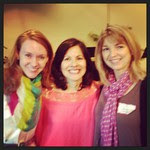 What a sweet time of fellowship last weekend with the women of Christ Covenant Church. It was the first time my daughter Mary, (blind) and I ministered together. I spoke and she sang. She sang the song below that she sang on our sofa for Elisabeth Elliot. I put the YouTube of her singing it to Elisabeth below and you can see a glimpse of precious Elisabeth at 86—what a dear saint she is! I want to pass on what she has taught me! Since Elisabeth had just left after visiting for several days, I was able to share in a fresh way what was on my heart. We laughed and cried last weekend together as we sensed the presence of the Holy Spirit! I loved these women. They trusted God to use me to speak to their hearts for their women's retreat weekend. No two of us were alike in the room, yet the same Christ lives in each of us. They asked that I post some prayers that I read to them. These prayers are unheard of in our society. Let's get on our knees and pray the earnestly before God, and we can be radically different wives! Thank you to all the single women that were there who gleaned spiritual truths. May all of us remember, it's "our part to trust, and God's part to work," and to "receive everything in your life as directly from God's hand." Amen, dear Sister? Rachel (L) and Jennifer (R) from Christ Covenant who invited me. Georgina from Ghana, and my college friend, Florence! Here is a copy of what I promised you! Two radical wife prayers ("I'll Take Him" prayer & "His Good & Unity prayer") written by Elisabeth Elliot, A Wife's Commitment (prayer, an interpretation from Philippians 2) "The Thorn" prayer and info on the book, "If I Perish." You can cut and paste them or print them on a card where you can read them back to God, or better yet, memorize them! I, being made in the image of God a believer, a woman and a wife, having equal worth in God’s sight and equal access to the Lord as my husband, I choose not to grasp after a position of equal leadership with my husband, which is not my God-given place, rather I choose by God’s grace to make myself nothing —taking on the very nature of a servant which was the attitude of Jesus. I choose to be obedient to God’s command and submit to my husband and die to myself. I understand that this decision will cause pain and suffering at times. But in those moments, may I all the more identify with my Lord. By his grace I will receive my reward worshiping Him in His presence forever —confessing Jesus Christ as Lord to the glory of God the Father. Biography entitled "The Small Woman"
I have turned off comments and will turn them on just on Wednesdays for prayer and sharing your blog due to getting so much (ungodly) spam. You can always write me at juanamikels(at)gmail(dot)com.